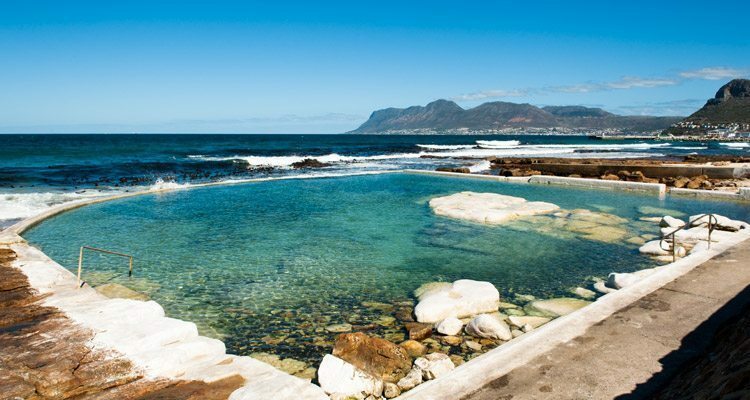 Cape Town’s coast is dotted with 19 tidal pools, beautiful man-made seawater pools that allow for safe, family-friendly bathing. 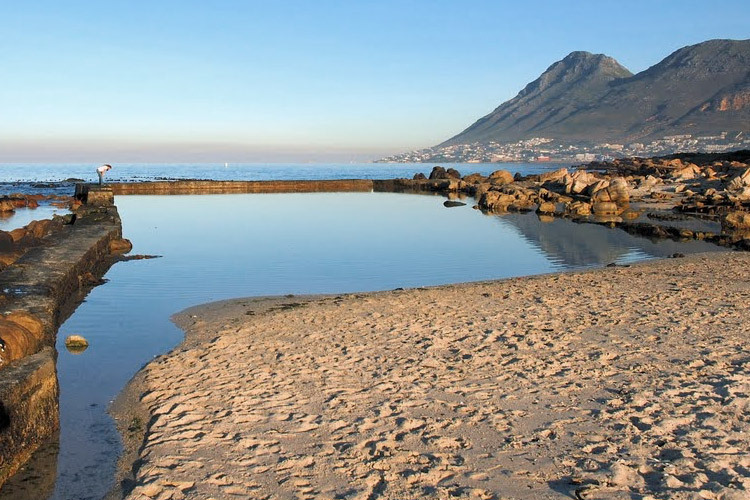 Dalebrook and St James, on the False Bay coast, are two of the most popular spots. 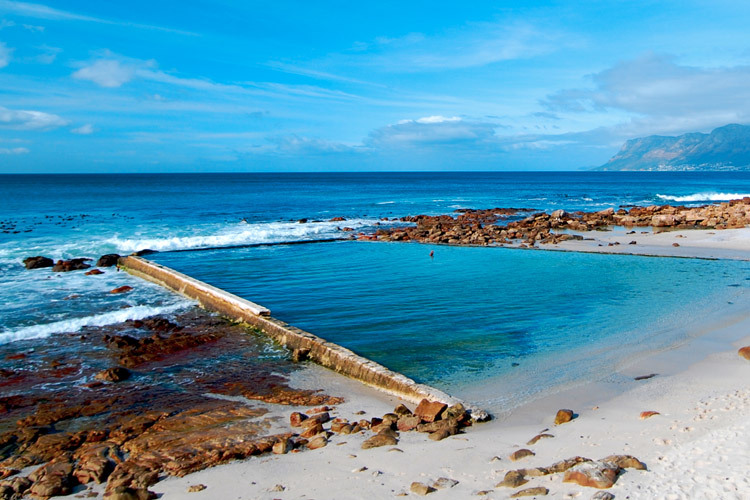 Here, kids splash in the shallows, people swim lengths and regulars enjoy daily submersions in the chilly water. 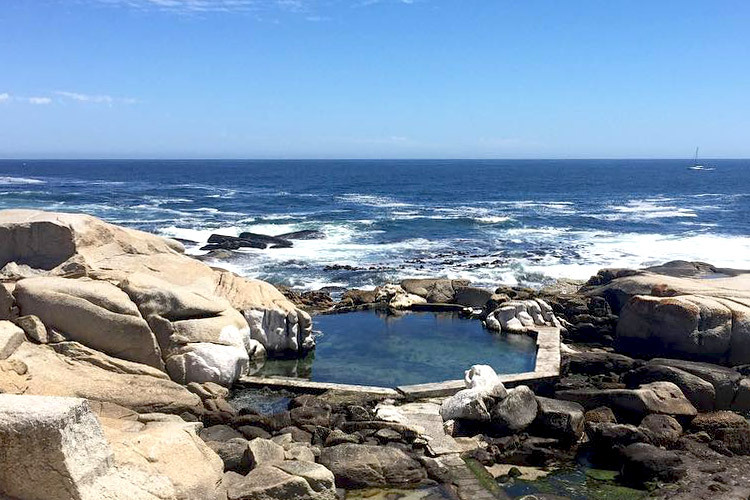 The pools also serve as sanctuaries for numerous sea creatures, which use the calm waters and the side walls and rocks for breeding and shelter. 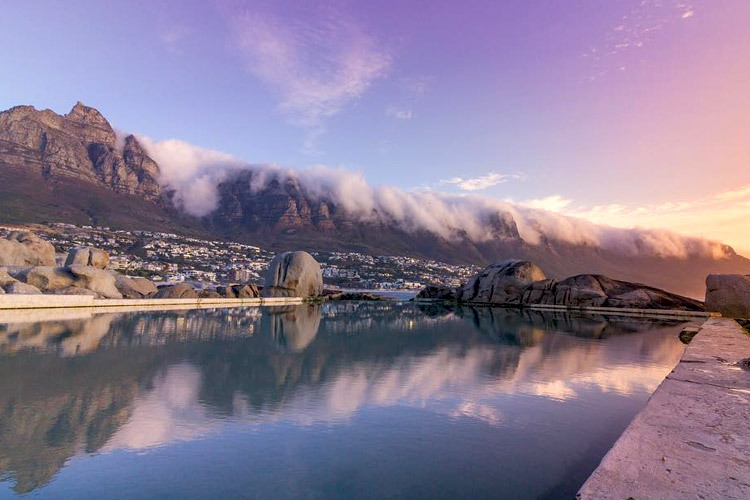 As more knowledge about the ecosystems comes to light and as more people become interested in learning about marine life, there has been a shift in how the pools are cleaned and maintained. For many years, the city used a combination of cleaning protocols that were harmful to the plants and creatures in the pools. However, with new awareness came a desire to conserve the ecology while still providing a safe, enjoyable experience for people using the facilities. However, an optimal solution is still being sought. The pools were drained overnight. Copper sulphate was applied to the algae on the tops and sides of the walls the following day. The tops and sides of the walls were scrubbed. A mix of lime and copper sulphate was applied as a first coat. A second coat of lime was applied. This method was done on a monthly basis. Lack of algae on the tops of the walls and stairs rendered them less slippery. Regular “blitz” method ensured pools were continuously algae free. 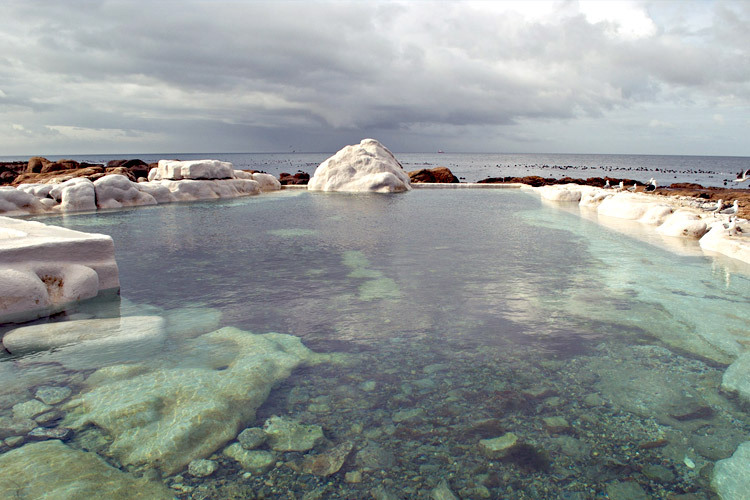 The draining of the water, combined with the copper sulphate, killed off almost everything in the pools. Copper sulphate is toxic to both humans and animals. The pools are no longer drained. Algae on the tops of the walls and the stairs is scraped off using metal brushes and scrapers. The side walls are no longer cleaned. The tops of the walls are painted with lime wash. Lack of algae on the tops of the walls and the stairs makes them less slippery. Marine life is left undisturbed on the side walls. The lack of draining leaves the ecosystem intact. Scraping off the algae is not completely effective and because it takes so long, it often leaves insufficient time for the application of the lime wash between tides. The main hurdle with the new cleaning protocol is the length of time it takes to manually scrape the algae off the tops of the walls and stairs and the efficacy of this method. In striving to find a long-term solution that will ensure enjoyment for those who use the pool, while protecting the marine life within them, we are testing various high-pressure hoses. We have found one that uses seawater from the pool and quickly blasts off all the algae – even stubborn layers the scrapers had been unable to remove. The efficiency of the power-blasting leaves more time for the application and drying of the lime wash. This in turn reduces the amount of lime wash bleeding into the water and enhances the efficacy of the lime wash in removing the algae. The city has not budgeted for a high-pressure hose, but as community-minded citizens we have decided to act and take responsibility for covering the cost. It’s a win-win situation: those using the pools will enjoy a safe bathing experience while the creatures and plants that live in them can continue to grow and thrive. 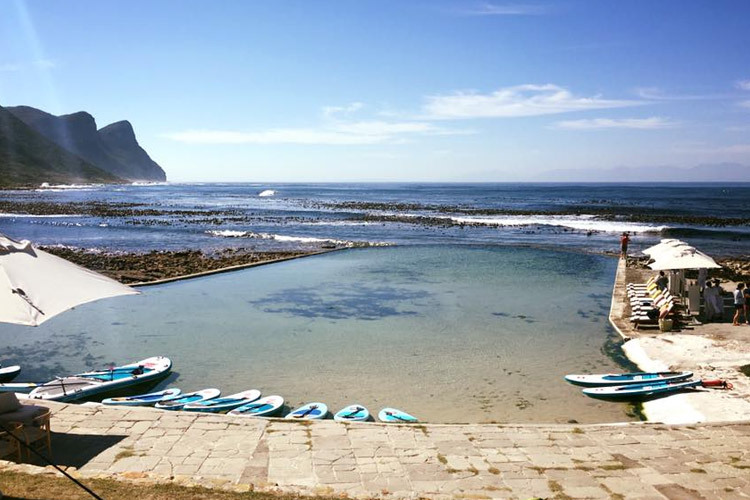 The hose we have identified costs about R28 000 and we need your help in reaching our total so that our tidal pools will continue to be rich and rewarding places that provide a special and educational interface between humankind and nature. If you too care for the preservation of these spaces and feel called to be a part of this solution, any amount available to you is most welcome. We believe this is a community space, not one person’s cause. We are in this together. Every R50 counts. Every R20 too. It’s together that we create change, not alone. All donations received here will go 100% to the tidal pools cause. Many thanks for your care and investment in our tidal pools. It is a beautiful gift to us all.